Among the first words out of my two year-old son’s mouth every morning are, “Can I have a banana?” He’ll eat five a day if allowed. So I’m hearing the call to get better about growing them in the yard. Here in Southern California? Can they really produce? 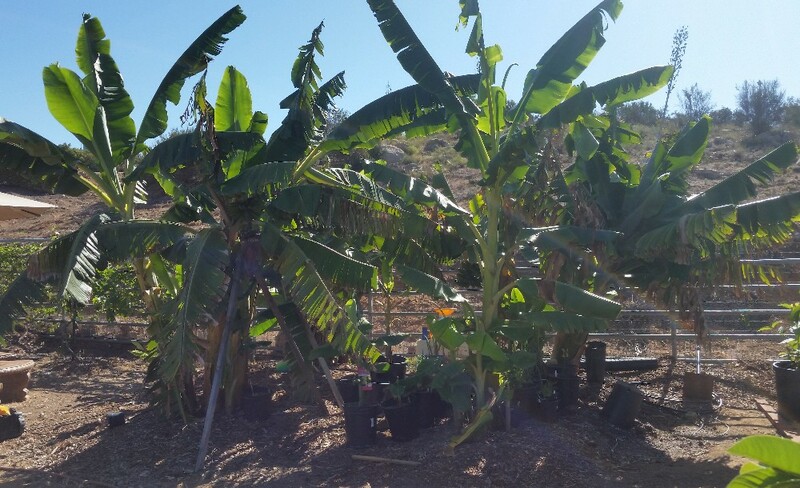 Bananas can be grown well and easily throughout most of Southern California between the mountains and the ocean, specifically Sunset Zones 24 down to 21 (find your Sunset zone here). Think of the areas that the marine layer consistently rolls over each summer night. This is where it’s a suitable combination of humidity and winter warmth. I’ve grown bananas within this ideal band. I used to live near the San Diego Zoo where, incidentally, many bananas are also grown. I’ve seen good banana bunches on plants farther north too. 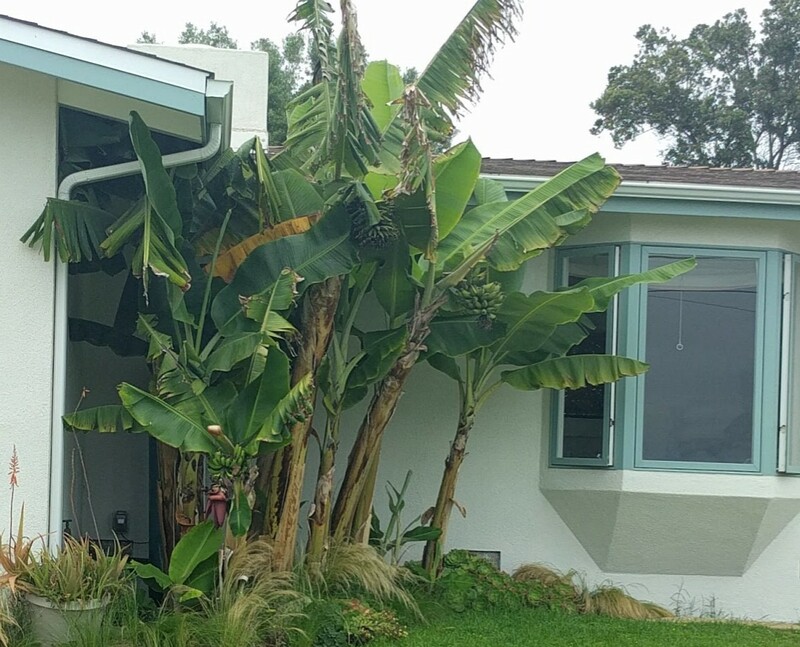 Here’s a producing mat of banana plants that caught my eye a couple weeks ago as I was visiting Carpinteria, in Santa Barbara County. It’s generally helpful for bananas to grow where the wind is not strong. This is for two reasons: they look better (leaves get tattered in wind), and the wind draws moisture out of the leaves. 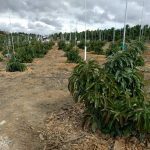 But being out of the wind is certainly not necessary for fruit production. Banana plants aren’t individuals like, say, tomato plants. Neither are banana plants trees like, say, orange trees. Banana plants are more like giant stalks of grass that grow out of a bulb-like base called a rhizome. 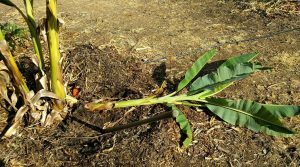 That rhizome continually sprouts up new banana plants. People usually call the group of banana plants emerging from a common rhizome a “mat,” but some call it a clump, and I sometimes think of it as a family. What does it matter how bananas grow? You want to know that when you put in a single banana plant, in a few years you will have many banana plants. That’s good and bad. The bad is that you may need to control the spread of the banana mat according to the space you have. You can do this easily by chopping off the baby banana plants with a shovel as they pop up. The good is that your original banana plant is always multiplying itself. 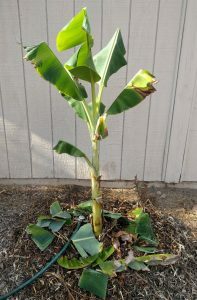 If you want more banana plants in another part of your yard, or if your neighbor wants some, you can grab a shovel and chop a small plant out of the mat and give it away or transplant it. Bananas are an “over the fence” type of plant, as they say. Even though I’ve grown many banana plants, I’ve only bought one. All others have been given to me by friends and neighbors, or I’ve transplanted pups from my own banana mats. 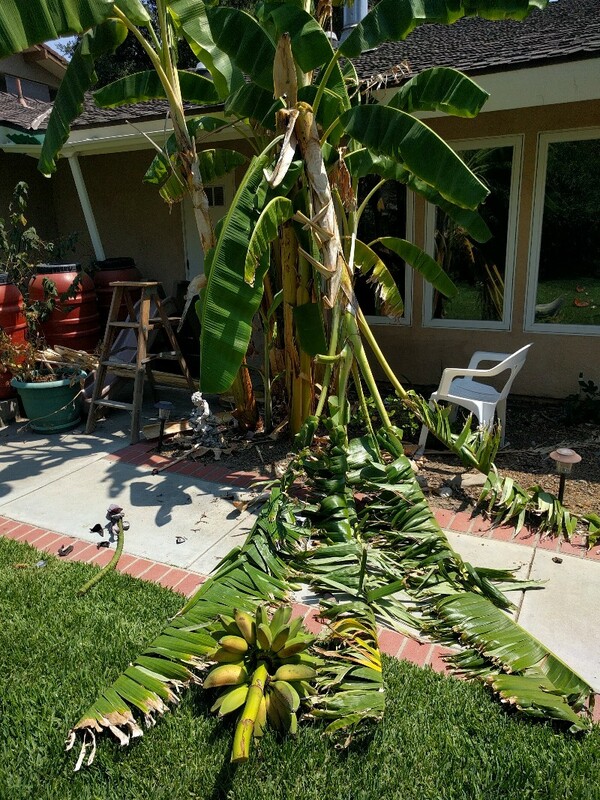 These bananas are growing in my aunt’s yard in Encinitas, started from a pup given to her by my uncle who lives in Covina. There is nothing tricky to transplanting a banana pup, also called a sucker. You need only to attempt to slice a chunk of rhizome along with the base of the sucker, as well as some roots if possible. The transplanted sucker may lose a couple leaves in its first weeks in the new spot, but that’s no big deal. You can even cut off all the leaves and the plant will soon start shooting out new ones. My habit is to chop the leaves in half just so the plant isn’t struggling to keep them alive, but I don’t really know if that’s the best way compared to doing nothing or cutting off all leaves. I only know that it works. The sucker I chopped out above, now transplanted with leaves cut in half. 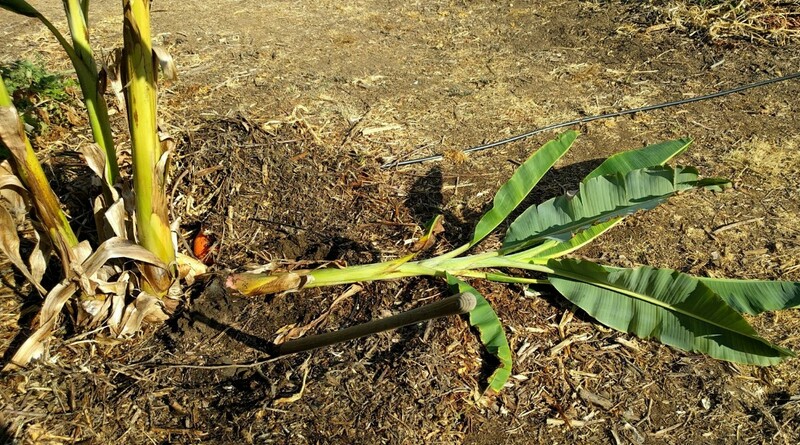 Within a year, that transplanted sucker will multiply into a mat, a family of banana plants. I’ve always tried to limit my banana families to a mother, who is fruiting, and only two or three children. Four plants total seems to be an effective number for a banana mat. 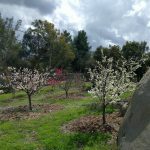 If more or allowed to grow, it’s said that they won’t fruit quite as well. I’ve never tested this personally, but from observing the banana mats of others it does seem true. I also know that many commercial banana plantations only allow two plants in a mat. Obviously, they primarily care about maximum fruit production. 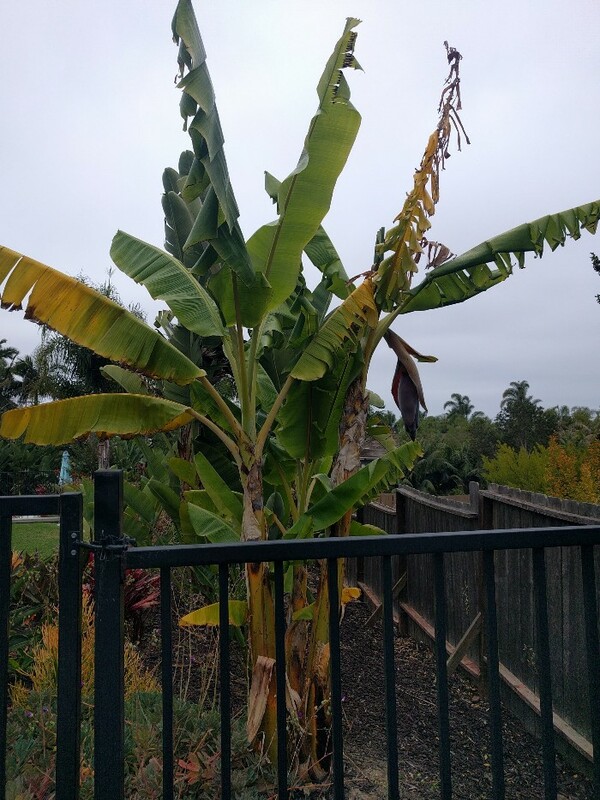 In Southern California, it takes a banana plant longer to fruit compared to the tropics since we have a cool winter in which our banana plants nearly stop growing. Most banana plants I’ve seen will send out a flower sometime around two years after planting — depends on the weather, variety, soil and watering. Then it takes some more — frustratingly slow — months for the bananas to grow fat and ripen on the flower stalk. Therefore, planting to eating ends up being around two years plus. What time of year does a banana plant flower? Whenever it feels like it. Bananas are a non-seasonal crop. And so also bananas become ready to eat whenever they feel like it. Much flowering and fruit ripening happens spring through fall around here, but that’s only because banana plants in Southern California are very active in the spring through fall. Sometimes a plant will start fruiting in fall and then the baby bananas just sit there like statues all winter until it warms up in spring, when they resume maturing. So what do you do when your banana plant flowers? Watch a most fascinating spectacle. A long thick stalk with a purple spearhead at the end thrusts out from the top of the trunk (technically called a pseudostem) and then groups (usually called “hands”) of bananas form along the stalk. The number of bananas that grow on this single stalk can be upwards of 50, and the weight of them can get so heavy that the plant topples over. This only sometimes happens. If it seems likely, you can build a prop to support the stalk. A simple prop can be made with 2×2 wood that is connected in one spot with a bolt, such that it can be opened into the shape of an X. The X is wedged under the leaning plant. 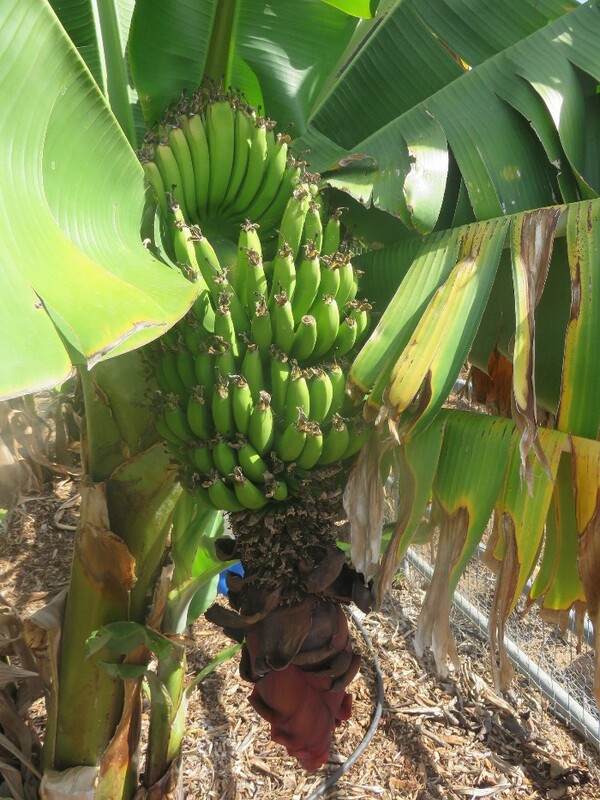 The bananas can be picked once they are plump (no longer so angular) but still green, as commercial bananas are, or you can leave them on the plant until they turn yellow and ripe. You can either cut off one banana at a time (starting at the top where the most mature ones are), or you can harvest the whole bunch at once and hang it somewhere, like in your kitchen. This latter method can be more convenient with varietes that are tall and hard to reach. Chopped down the plant in order to harvest this bunch. Sadly, a banana plant that has fruited is a banana plant that has fulfilled its end in life and will begin to die. So you can, after harvesting all the fruit, cut off that particular plant. A machete works well for this. Gladly though, this mother plant has pups coming from the rhizome to take its place. The “family” is not dead, only that single mother plant that just fruited. To keep a banana plant happy in Southern California, the main thing you need to do is give it water in the dry months of the year. Bananas need little water during the winter here, when they’re almost dormant, but in the summer they love to drink. Give a banana ample water when the air is warm and it will unfurl new leaves before your very eyes. The other thing bananas appreciate is fertile soil. 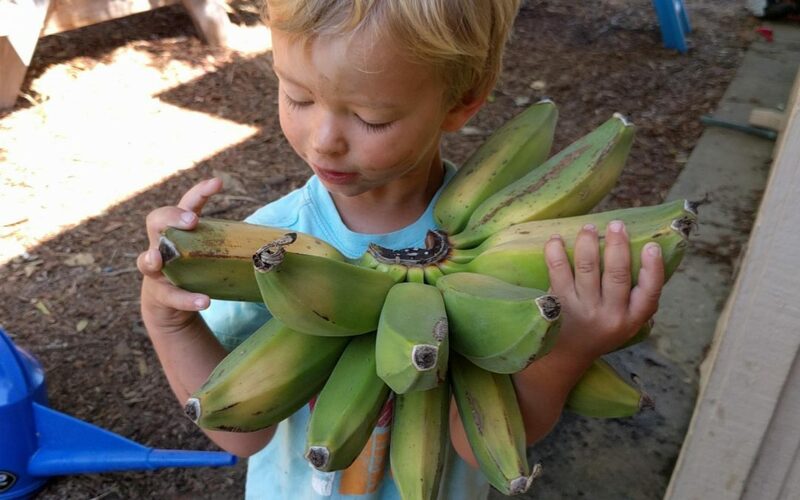 Sure, many plants appreciate fertile soil, but bananas appreciate it more than most. They’ll grow and fruit even if you never fertilize them. I know this because I’ve done it and I’ve seen friends and neighbors do it. But I’ve also seen how much faster bananas grow in fertile soil, and how much bigger bunches they produce in such conditions. Bananas’ love for soil fertility was once illustrated to me when I grew some around a compost pit. 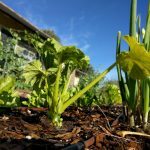 I had dug a pit and filled it with food and garden scraps, and then planted four bananas around the edge. Some months later I dug one of the plants out and found that it had far more roots on the side facing the pit, where it could feed on the compost. 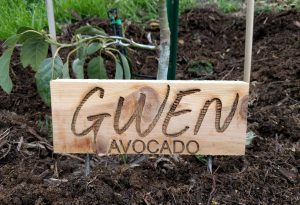 A friend does something similar by occasionally digging a hole near his bananas and filling it with food scraps, covering it again with mulch. He also uses a fertilizer called ClassiCote 15-8-23. I’ve never used this product, but judging by the results he gets, it is doing no harm. Zoom in to see that he has multiple large bunches on multiple mats. You may be surprised to learn that there are oodles of different kinds of bananas out there. The ones we buy at the grocery store are only one type called Cavendish. 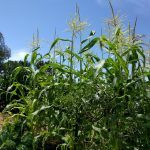 But when you grow your own, you’ll likely grow a different type and you’ll be able to experience new banana flavors and textures. You may like them more or less, but they won’t be just like the ones from the store: maybe smaller, maybe not as sweet, maybe firmer, maybe fatter, maybe with bigger seeds, maybe harder to peel, maybe with whiter flesh. Recommendations on varieties to try? I have a hard time making any recommendations because I’m not sure which varieties I have or which are which. I have given up trying to figure it out. Like I mentioned in the post above, almost all of mine have come from friends or neighbors and they weren’t always aware of the variety they were giving me. But I like all that I have, and I THINK I have Ice Cream (also commonly called Blue Java), Goldfinger (also called FHIA-1), and Brazilian Apple (also called Apple, or Manzano). That’s another difficulty: banana varieties seem to always have multiple names. I have others that are totally unknown to me. If you like, I can try to get you some fruit sometime and if you like it, get a pup for you from that mat. Oceanside is a deceptive area. Even though it’s considered Sunset zone 24, there are parts that get surprisingly chilly in the winter such as near the harbor or inland up the San Luis Rey river a bit. I surfed around there and worked near the airport for a handful of years. Some of those parts are capable of getting cold enough to damage bananas. So, if you live up a hill, then you’re probably safe planting those pups out. But if you live in a gully where it’s colder then I’d wait until March 1. If you wait, don’t bother putting them in bigger pots. Just wait. 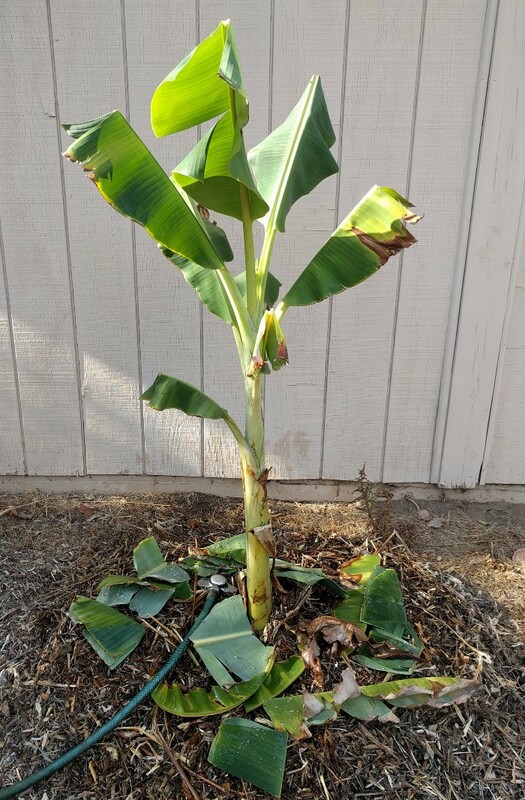 Bananas in Southern California just stall and don’t grow until it starts warming in February (unless they’re in some kind of artificially warm environment). I live in North Poway and want to plant some banana trees. Where do I go to buy them? I would first check Walter Andersen Nursery just off Scripps Poway Parkway near In-N-Out. If they don’t have any or many bananas in stock at the moment, they’ll surely be getting some in the next month or two. Might as well wait. Unless you’re in an exceptionally warm spot, the bananas will prefer to be planted outside after this series of cold storms and chilly, frosty mornings. You can also check with Armstrong in Rancho Penasquitos. That’s probably fairly close to you too.